This weekend was marked by being 'bitty', as in I did a bit of this and a bit of that and didn't really seem to achieve very much. On Saturday morning we headed over to the local Ford dealer to have a proper look at the new (ish) Focus Estate. I currently drive the original design and excepting the tendency towards developing an indoor swimming pool in the passenger footwell, I'm very happy with it. However, it is getting on a bit and I probably need to start thinking of changing it and so off we went. My intention was to look properly at the new body shape, to sit behind the wheel, play with the seats and look at how the changed shape has effected its loading capacity. I was just intending to look you understand. The sales lady said she'd try to get one in for me to look at, so I left contact details and walked away. This does not bode well and shows why I hate car shopping. Or possibly, I've improved on my tearing off of locks and initial processing stage which means I'm producing nicer scoured fleece? Who knows, but fleece processing is continuing apace. I did some more picking. That's it really, I picked fluff a little while I washed fleece but still don't have a huge amount to show for my work. 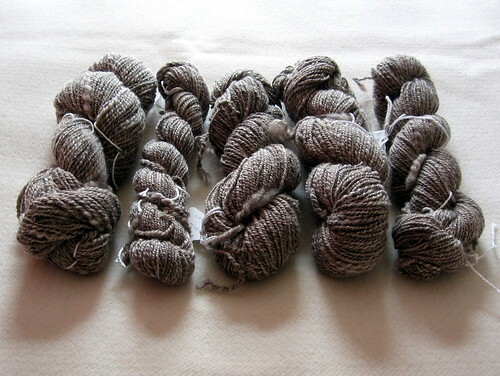 There isn't a lot there and it seems to take me an age to produce yarn, mostly because I get so little time to do any actual spinning at the moment. An hour a week ... sometimes... if I'm lucky... just isn't cutting it. The quality is variable too; I tend towards spinning quite thin singles with a lot of twist so this two ply is very springy, tightly spun and about the weight of a conventional 4-ply, in most places at least. In some places it's a lot skinnier than that, while in the odd place it gets a bit thicker. Controlling the drafting process is coming along, but very slowly because I'm not getting enough practice. 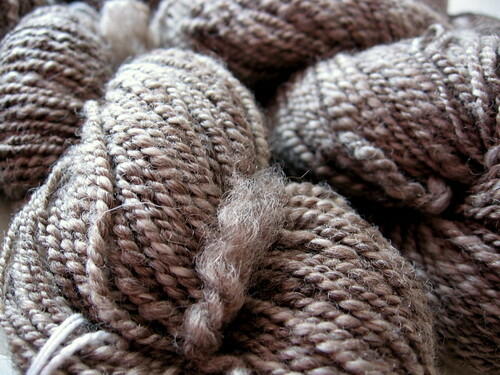 However, I'm getting an itch to try out my handspun and see what it actually knits up like. I wouldn't like to try crochet with it yet, as the yarn is very variable in quality and I think it needs the control that knitting offers. So, I'm thinking a hat. Maybe this hat. 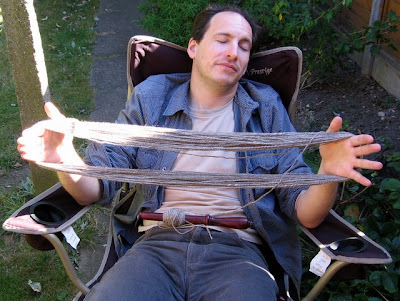 And maybe, if I held it double the two strands would even out the yarn? I think some swatching may be required and soon, given that I'm on the last round of the humungous doily (finally and this last round is taking an absolute age). With this in mind, I loaded up my swift and wound two skeins into balls. This is my first ever banana cake and it was very yummy; it didn't get a chance to cool properly before we started on it. Unfortunately it smelled too good and we just couldn't resist. I'm not much of a baker, but we had overripe bananas and so I thought I'd give it a go. Given how tasty and moist it is and not at all like how I remember my mother's banana cake, I'm going to call it a success. Finally, we went to an art exhibition in Coventry's Canal Basin last night. Dave takes weekly lessons with Al Davison of The Astral Gypsy, so had an invite to see his work. The theme was Dr Who and the pieces on display were very good. So a very full weekend, doing lots of things but not really centred around a single theme. 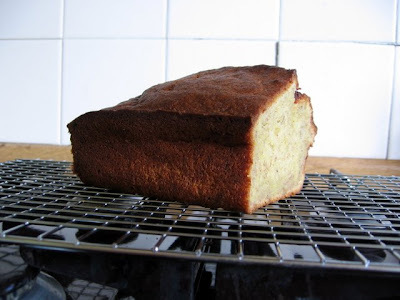 Looks yummy, your banana cake is making me feel quite hungry. I love your handspun it looks gorgeous.